Does anyone else watch "The Marriage Ref"? I watch already aired shows on demand and find it both fascinating and funny. I don't watch all the much reality television with the exception of cooking shows, decorating shows, craft shows (when I can find them--they have gotten scarce) and marathons of "Project Runway" (I guess I watch more than I thought!). I suppose I like the absurdity of this show. Three disparate celebrities (as we all know celebrities are well known for their solid and healthy relationships) discussing and judging quirky issues married couples have (like a wife keeping the prosthetic leg of her deceased husband in the closet she shares with her current husband or a husband stuffing his beloved dog and placing him in a shrine built in their house to his wife's horror) whilst sparks fly between the couples, celebrities and ref. Good wholesome fun! Now onto something completely unrelated! Here is a birthday card I made for a cousin of mine. The butterfly by Unity Stamp Company (from one of the kit of the months--great deal) I had left over from ATC's I made that month and was the beginning piece of the card. 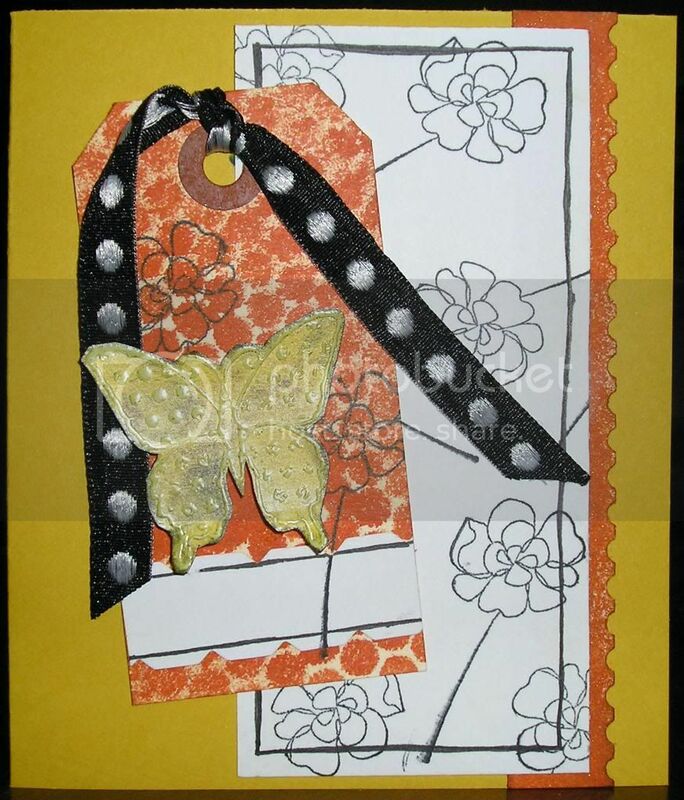 Stamps: Butterfly (from KOM-9: Friendship. Love. Miracles set), Unity Stamp Company and Flower (from Botanical Blooms set), Stampin' Up! Cardstock: White, Georgia-Pacific; Crushed Curry, Stampin' Up!